At Your Dressmaker, we seek to provide period clothing for role players of all ages. Make sure the entire family enjoys the next historical event in the proper style with our selection of kids period clothing. The same handmade items we offer for the adult members of your family can be custom-made to fit your children. If you wish to attend a medieval festival with your kids by your side, we have dresses, petticoats, pants, doublets, jackets, cloaks, and robes that add an authentic touch to their costumes. Perhaps your son or daughter needs clothing for traditional highland dress. Tartan dresses and kilts are among our unique designs. 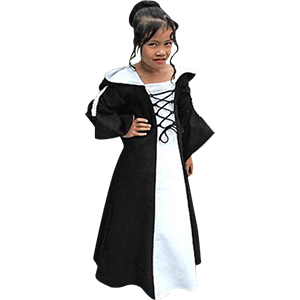 Whether your child wishes to participate in a theatre show, SCA event, a Renaissance fair, or a pirate themed reenactment, we have period clothing worthy of the task. Our garments are handmade by our in-house tailor-team. We offer customization in colors, fabrics, and style, aiding in the quest to create a unique, yet authentic historical persona. Whether your child wishes to portray a historical icon, or present a steampunk character of his or her own design, at Your Dressmaker, we offer a fantastic variety of historical clothing for the young role player. The team at Your Dressmaker believes role players of all ages should be able to create a unique, yet authentic, character of their own. 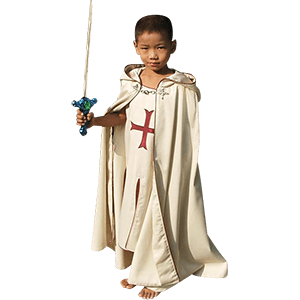 Our fine selection of boys historical clothing includes garments from the Medieval, Renaissance, and Victorian eras. Our unique designs include shirts, pants, and jackets suitable for adventuring on the Seven Seas as a brave pirate. We offer cloaks, tunics, and robes suitable for medieval festivals and renaissance fairs. Perhaps your child wishes to venture into Neo-Victorian society for a theatrical performance, or participate in a Civil War or Roman reenactment. Our boys clothing includes items that cater to these eras and more. Not only do we offer unique designs geared towards children, each of our adult patterns can be custom-made to fit your son as well. At Your Dressmaker, you may choose between fabrics, colors, and styles. Our in-house team of tailors will create the period costume that your son needs to succeed in his chosen role. So take a closer look at our special collection of boys period clothing. We at Your Dressmaker are certain you will not only be impressed by the variety found in our collection, but also the quality and care we put into every garment that we create.